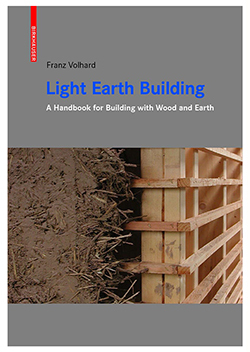 Light Earth Building: A Handbook for Building with Wood and Earth by Franz Volhard. When Robert Laporte went to Germany in 1990, there was only one current and definitive text on LSC building: Architect Franz Volhard’s Leichtlembau. Alter Baustoff-neue Technik. Fortunately for North Americans, after several editions, Mr. Volhard has very recently published his work in German, French and English. Light Earth Building: A Handbook for Building with Wood and Earth (find it here) covers multiple techniques, illustrated by contemporary case studies of LSC building from around the world. It is also the most comprehensive publication on the physical characteristics of LSC to date.